After moving from San Francisco and retiring from the trade show business, Carl and Pam Bowker had settled in the windy Templeton Gap area west of Paso Robles on the Central California coast. The couple’s newly purchased vineyard was producing a mix of Cabernet Sauvignon, Chardonnay and Pinot Noir, but Carl was not convinced his vineyards would develop world class wines at Caliza Winery. 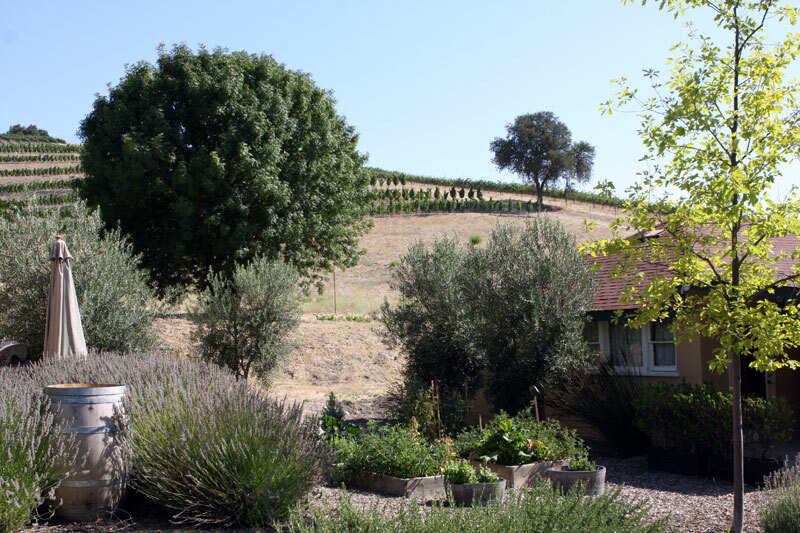 For Part I on the Caliza Winery story, please read the Nov. 12, 2012, post, Caliza Winery: Bowker turns horticultural focus into viticulture dream. In Part II of the Caliza Winery story, Carl shares how his 2004 trip to the Rhône Valley convinced him to make the hardest decision he’s ever had to make in his life. Carl and Pam Bowker had traveled to Italy in 2001 and their eyes were opened to utilizing old world wines in a new world venue. They farmed the vineyards on both of the Caliza Winery properties, but Carl longed for a stronger connection to the limestone soils he named his winery after. He began spending more and more time with winemakers in Paso Robles and became more familiar with the emerging interest in Syrah and other Rhône varietals. During a party for a real estate agent, Bowker met winemakers Erich and Joanne Russell of Rabbit Ridge Winery and Russell Family . Carl Bowker’s, left, passionate interest in winemaking caught the attention of Erich Russell of Rabbit Ridge Winery. 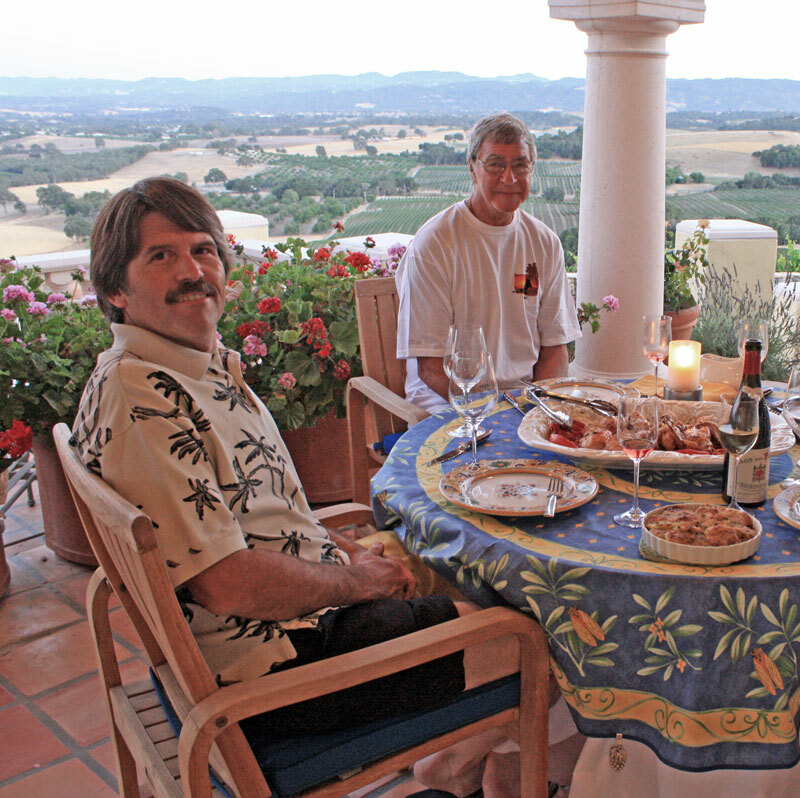 The two forged a friendship and have shared many social times together, including this 2009 Provence-inspired dinner at the Russell home with their wives, Pam and Joanne. While Bowker was a green horn in 2002, it didn’t take him long to become an integral part of the harvest for Rabbit Ridge and Russell Family wines in 2004. But it was during their time together that the Bowkers and Russells became friends. They shared dinners together and began talking about an ever-growing excitement for Syrah and especially Rhône varietals. Both couples signed up for a trip to France led by a small group of wine writers. 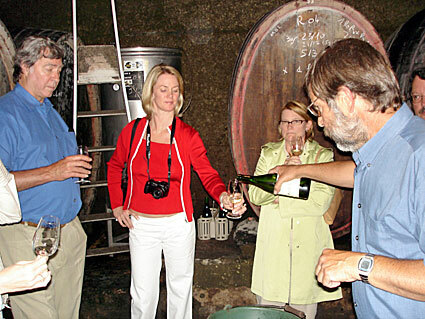 Erich and Joanne Russell, left, chose to vacation in France with Pam (right center) and Carl Bowker for a two-week trip to the Rhône region in 2004, visiting over 15 wineries. Russell fondly remembers the Rhône trip with Bowker as it not only solidified their friendship but also helped keep him focused on Rabbit Ridge value-based wines. After his 2004 trip to the Rhône Valley, Bowker made the decision to rip out all of the existing vines on his Anderson Road property and plant Syrah clones. He also planted other varietals, including Grenache on this hill behind the tasting room. Not only did Bowker tour and taste while in France but he asked numerous questions about the vineyard planting methods, irrigation, soil-types, root stock varieties and clones, so that he could use this knowledge in his new Paso Robles vineyard. Together, with the two-year Napa Valley College viticulture and enology program, Bowker had the confidence to forge forward. The Spanish word, “Caliza,” means a thin band of limestone. The catchy word describes the layers of soil under Bowker’s Syrah and Rhône varietals. His new-found inspiration morphed into a determination to join the growing movement of Paso Robles wineries planting Rhône varietals, creating for the Central Coast a Syrah-based regional identity parallel to Napa’s Cabernet focus. The trip to France solidified his Rhône focus. He then chose to have his soil tested by a soil scientist, hiring consultants by the end of the year. Wine Spectator’s James Laube believes the Paso Robles area focus on Syrah and Grenache has strengthened the region. The epicenter of this blending has created a term used by California winemakers with many referring to the winemakers as Rhône Rangers. After harvest in 2004, Bowker made a critical decision that would alter the direction of Caliza Winery for the following year. Bowker says the 2004 French tour inspired him to make a “killer Syrah” and believes he is now making that quality Syrah from fruit off his Anderson Road vineyard. While other vineyard owners were beginning to consider changing out their vineyards in the Paso Robles region, Bowker’s decision was not without risk. Hawley is a California State University, Fresno, with a degree in viticulture and enology. The Bowkers met him in Paso Robles on several occasions while he was a winemaker at Summerwood Winery and became huge fans of his winemaking style and ability. A very successful winemaker in his own right, Scott Hawley, now of Torrin Vineyard, became Bowker’s mentor and consultant in the early days of winemaking for the new Caliza brand. The first Caliza wines were made in 2006 from mostly purchased fruit as Bowker’s new vineyard was not yet producing. Grapes from that first vintage were sourced from neighboring Torrin Vineyard as well as the Russell Family Vineyard, just a short distance away. Bowker became confident Caliza Winery was going to be a major part of the Rhône movement like his Anderson Road area neighbors such as Booker Vineyard, Brian Benson Cellars, L’Aventure Winery and Torrin Vineyard. As his skills mature, Bowker continues to focus on the details of winemaking but has learned to balance analytic chemistry in the lab and the creative ‘gut feelings’ of the best vintners. Shortly after meeting Bowker, Hawley said he knew this winemaking greenhorn was different than most Paso wine folks he had come into contact with. While Bowker was inexperienced, without a track record in the wine business, Hawley said the newest Templeton Gap resident had the motivation, ambition, and focus to create something special. Caliza Winery is one of many wineries on Anderson Road making Rhône-style varietals. While co-owner Pam Bowker, left, can often be found in the tasting room she will also become president of the local Rhône Rangers chapter in 2013. As far as Hawley could remember, Bowker had a penchant for details. Carl was so focused on the process, he took everything literal and often became the punchline of winemakers’ jokes. Carl and Pam Bowker produce 6-8 Rhône varietals on the Caliza property, including the Tanzer International 91-point rated 2010 Azimuth. The major strength of the Caliza Winery is that it’s almost completely self created. Most of Bowker’s wines are estate grown; he planted the vines himself and each year he helps pick, crush, create and bottles the wine. He is the whole picture. He knows what he wants when the year starts and is focused on gaining the unique characteristics of the vineyards. Carl’s winery has a fine collection of six different Rhône-style clones, allowing him to handcraft his estate wines. Many are award-winning, including the 100 percent Rhône-style 2010 Syrah as well as the 2010 Azimuth which blends 40 percent Mourvedre, 30 percent Syrah and 30 percent Grenache. Caliza’s Syrahs and Rhône-style blends are award-wining, unique, big and intense. Bowker knows and experiences and lives out the whole picture, block, vineyard, and year with the final product. He is hands-on from beginning to end and there is a story behind each bottle of wine. 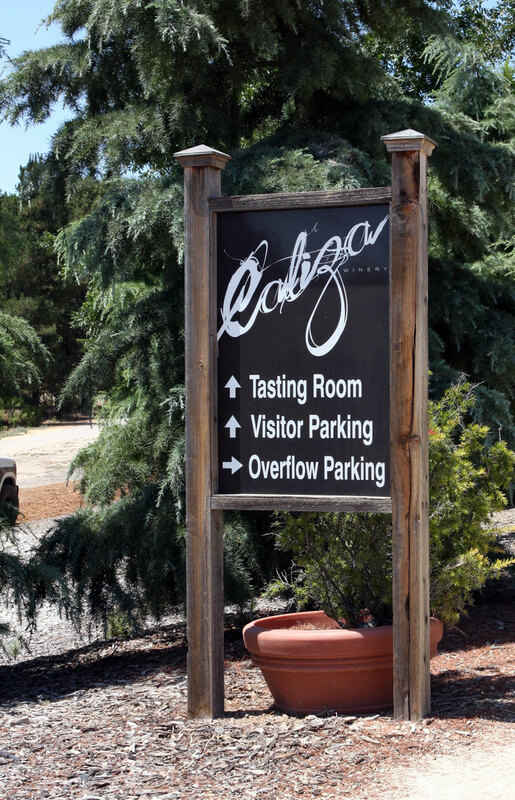 Caliza Winery is located on 2570 Anderson Road, Paso Robles, CA 93446. The winery tasting room is open Thursday through Sunday, 11 a.m.- 4:40 p.m. or by appointment by calling 805.237.1480. Bowker and his wife, Pam, are members of the Paso Robles Rhône Rangers regional chapter: a term used to describe those who produce Rhône-style wines in the United States. They also belong to the national Rhône Rangers: America’s leading non-profit organization dedicated to promoting American Rhône varietal wines. Caliza is a very active participant in the organization, both nationally and in the local Paso Robles chapter. In fact Pam will lead the Paso Robles chapter in 2013 as president. Carl has been on the Rhône Ranger panel for several seminars discussing Rhône wines at the national event held each year in San Francisco. Be sure to check out the 16th Annual Rhône Rangers San Francisco Tasting, March 22-23, 2013, at Fort Mason. Over 500 of the best American Rhône wines from more than 100 Rhône Rangers member wineries will be poured. The Paso Robles regional chapter of the Rhône Rangers will next host the 2013 Paso Robles Rhône Rangers Experience at the Broken Earth Winery, Feb. 17, 2013. Over 40 wineries will explore with the public what makes Paso Robles so ideal for Rhône varietals. Tickets for the seminar and lunch are $85. For more information on the Rhône Rangers, read the March 31, 2011, Wine Spectator article, “Talent Show”; it briefly outlines the Paso Robles’ new wave of wines from this growing network of California Rhône go-getters. Be sure to read past winemaker’s stories, including Get to know 2012 Coast winemaker of the year: Mike Sinor .